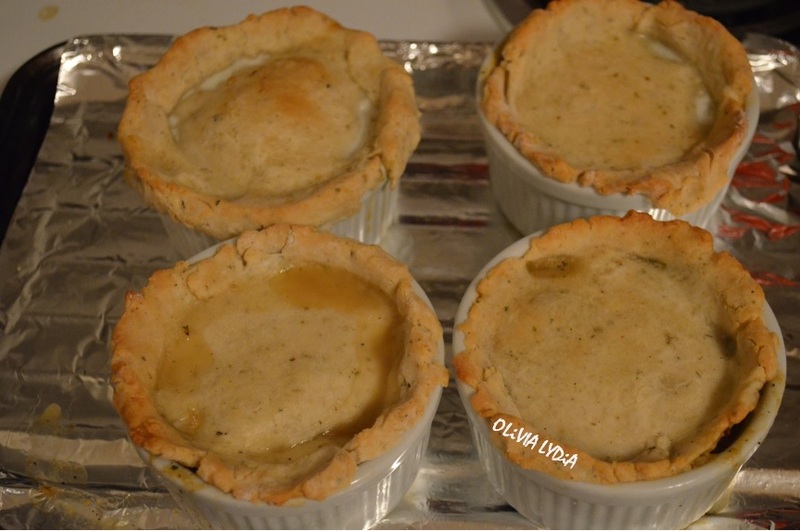 Sage-Ginger Crusted Veggie Pot Pies – Olive For Greens. 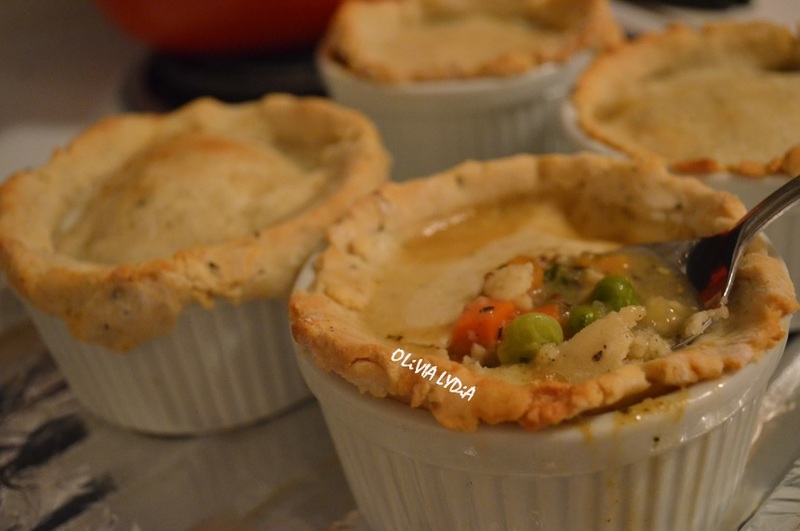 I’ve always loved potpies but never had a homemade pot pie before. One day, while watching the cooking channel, one of the chef’s was making a potpie. I was so intrigued. I was up for the challenge to make a vegetarian pot pie because, of course, the one on T.V was made with chicken and made with all purpose flour. Mine version is Vegetarian and Gluten-free. They are also low-carb because the crust is only on the top. This recipe came just in time for the cold season! Servings: Makes 4 1-cup ramekins cup. Quick Veggie Alternative: Instead of the peas, carrots, celery and corn 1 ½ cup frozen mixed veggies can be used. In a medium pan add the coconut oil and sweet potatoes. Mix constantly over medium heat for about 10-15 minutes (until soft). Meanwhile, in a small bowl mix the gravy and milk. Set aside. Add the mixed vegetables to the pan with the sweet potato. Incorporate together for about 5 minutes. Next, add the gravy mixture to the pan. Cover and simmer for 10 minutes. Remove from heat then divide the mixture into 4 1-cup ramekins 3/4 full. 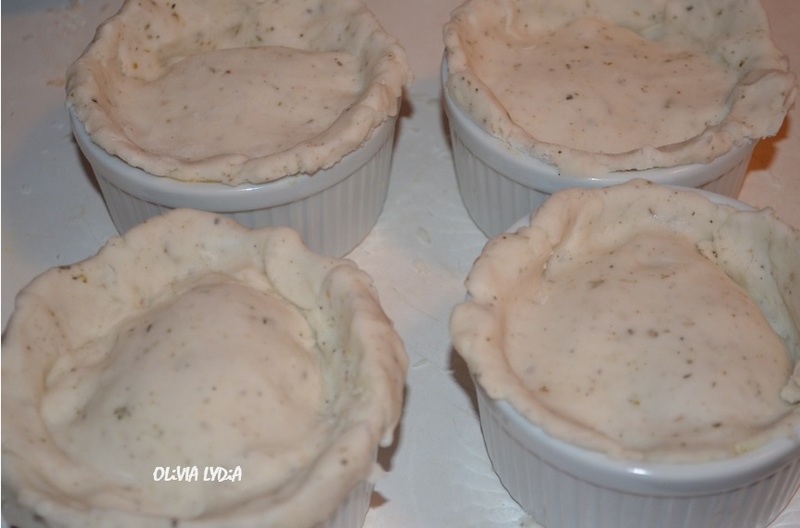 Caution: Do no overfill the ramekin or while the potpies are in the oven the will over flow and there will be a mess! Combine all of the dry ingredients in a bowl and mix together. Next add the milk to the dry ingredient. Then the butter. Form the dough in a ball and roll out. With a pizza cutter, slice the dough down the center both vertically and horizontally. 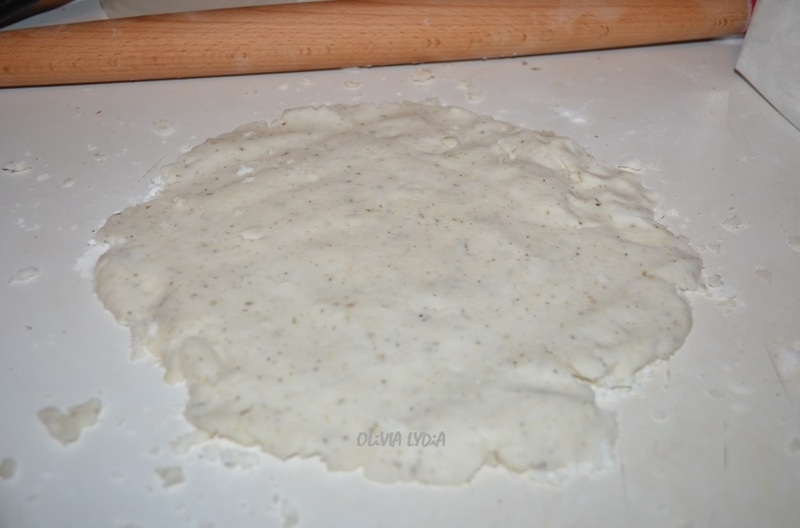 Roll one quarter of the dough into a small ball then mash with your palms against the counter top. You should have a disc now, a little wider than the ramekin cup. Place the dough over top of each filled ramekin. Brush melted butter over the tops of crust, if using, then poke 3 fork holes. Bake for 20-25 minutes, until the crust is golden brown. Pingback: Vegetarian Gravy | Healthy but tasty vegetarian eats. Search Recipes by name or Ingredient!